For months, the nation's finest amateur detectives (Rust Cohle, and one of our editors among them) have been trying to crack the case of the Doritos Jacked mystery flavors. Well, Doritos finally busted the thing wide open, and it turns out Test Flavor 855, aka Spicy Street Taco, is the people's choice. You'll remember Spicy Street Taco as the red bag full of cayenne-blasted chips. As for its two rivals, Test Flavor 404 (yellow bag... or Yellow King?!) was Caribbean Citrus Jerk, while Test Flavor 2653 (blue bag) was Chocolate Chipotle Bacon and not, sadly, our guess of Tijuana Girl Scout. 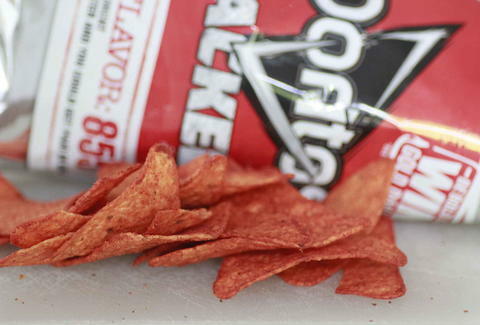 Unfortunately, only one variety will come to grocery stores as an official Doritos Jacked flavor this Fall, and Spicy Street Taco garnered the most votes on the Bold Flavor Experiment site due to its "bold combination of Sriracha sauce and savory taco spices cooled with a kick of sour cream". With this case closed, we can finally re-focus our attention on the disappearance of Doritos 3D, one of the most disturbing cold cases in snacking history. Kristin Hunt is a food/drink staff writer for Thrillist, and is surprised anything with "bacon" in it lost. Follow her at @kristin_hunt.